The Rosy Starlings that “invaded” the Balkans a few weeks back have now started breeding. These nomadic birds regularly pass through our country in spring, but do not always settle to nest, and as far as they do that they rarely form more than one colony. This year is an exceptional one – there are several colonies with thousands birds each! It is a really great opportunity to come and enjoy them now, in June, until mid-July. 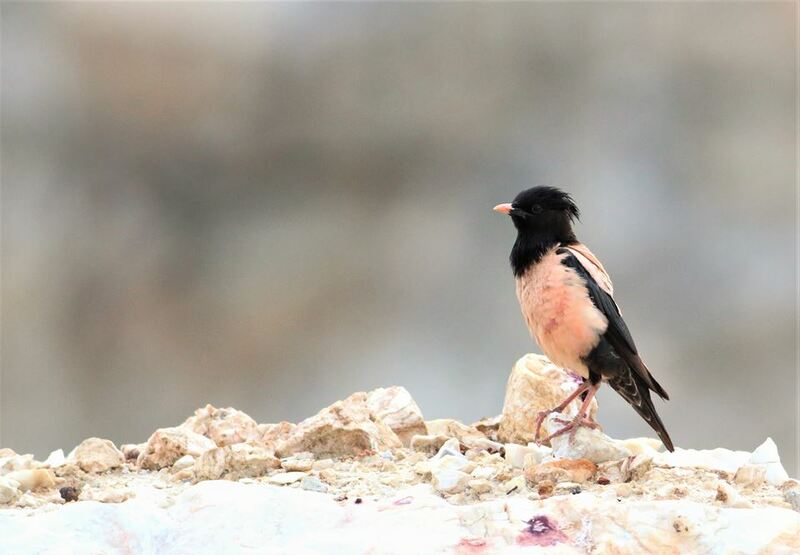 The breeding range of the Rosy Starling is from easternmost Europe across temperate southern Asia. It is a strong migrant, and winters in India and tropical Asia. In India in winter it often appears to outnumber the local starlings and mynas. The Rosy Starling is a bird of steppe and open agricultural land. In years when grasshoppers and other insects are abundant, it will erupt well beyond its core range, with significant numbers reaching western European countries too. In Bulgaria Rosy Starlings usually breed in tight colonies in a relatively short breeding season, timed to take advantage of peak abundance of grasshoppers, cherries and other orchard delights from mid-May to mid-July. They are highly gregarious birds, and often form large, noisy flocks, which can on occasion be a pest for growers of cereal crops or orchards; the birds are strongly attracted to flowering trees. However, they are also greatly beneficial to farmers as they prey on pests such as locusts and grasshoppers, thereby limiting their numbers. Classic Spring Birding Tour, Spring Bird Photography Tour, The Best of Bulgaria Tour, Mountain Birds, Flowers and Butterflies, on some of our one or two-day birding trips, or we can design a special tour just for you! Don’t miss the great opportunity to enjoy this year’s rosy spectacle! Please consider your options quickly and contact us as soon as possible.